Forex Factory is more than just an information portal to help you with your trading. The information that is found on this site is up to date, high quality, reliable and informative. Best of all, the website is easy to navigate so that the information that you want is only ever a few clicks away. The entire goal of trading is to make a profit. But when you are new it is hard to filter out what information is reliable, what is useful, and what will help you make a profit. Using old information can hinder your ability to make a profit. As a trader, you need reliable information that is current, so that you can make the best trading decisions. Members of Forex Factory come from all over, lending their expertise and experience to help each other out. If you have a question about any aspect of trading, you will be able to get it answered here, and quickly. This website is designed by forex traders to be used by forex traders in particular. But traders of financial futures will find much of it useful too. One of the features of the site is called the Wisdom Vouching System. This allows members to vouch for one another. So members can tell at a glance, who is the most experienced and trusted when it comes to seeking advice from others. Often, trading sites are set to a single time zone. This can lead to avoidable mistakes! However the Forex Factory site can be set to your own local time. So you can avoid the errors that other traders sometimes make. The calendar is one of the more innovative and useful areas of the website. It is a page we keep up throughout the trading day. 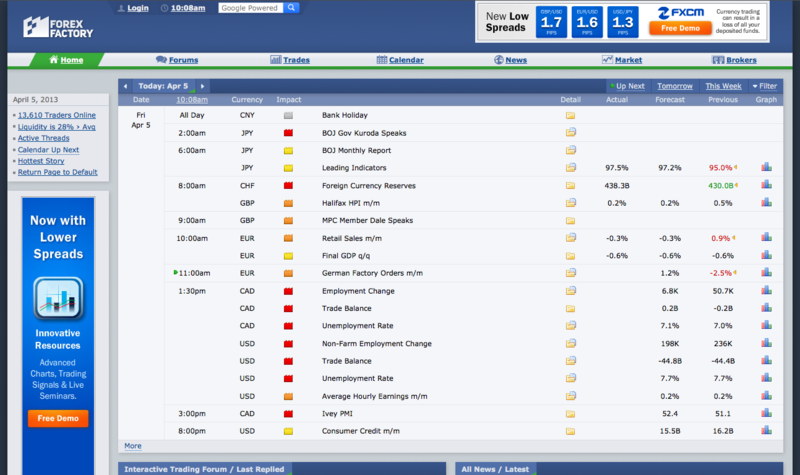 The calendar gives traders notice of when economic reports are to be released. So we can be prepared and NOT get caught up in wild reactions at the time the data is released. How accurate is the information on the calendar? It is the calendar we use and suggest our students use. So it is the best resource we have found over the years. The data itself is accurate and reliable. This is why it is used a data source for many other sites! The forum is where new traders and experienced traders interact with each other. This is a highly active part of Forex Factory. Of course we have our own forum for our students. This is a smaller closer community specialising in our techniques. But that doesn’t negate the value of the Forex Factory forum where a wealth of other knowledge and resources can be found. The news centre is unique in that any member can submit a news story and then a team of editors will filter through the submitted stories and post the approved ones to the site. What this means is that members are getting news from around the world, twenty-four hours per day. As breaking news happens, it will get posted in the news section. So you can track news quickly, as it happens, right from the source country. The market component is broken down into four different applications: broker quotes, sessions, composite quotes and charts. The Market Data System that powers these applications is truly innovative, averaging broker rates in order to give traders reliable data of what the fair market price is. This is obviously for forex only. It is the Forex Factory after all! This application gives traders the ability to analyse their performance and it can be synched to their brokerage account for better real-time analysis. For the traders who make use of the Trade Explorer application, their trading activity is aggregated and available here. The Trades application has three applications within it – the positions, the leader board and the trade feed. This is the newest section of the site and it serves as a guide to forex brokers. This is the go-to product for traders who need a forex broker and are looking to make an informed decision. Forex Factory is a high quality website, one that takes pride in its members and the accuracy of its information. For anybody with an interest in or who currently is trading forex, this site will be a valuable resource.